Indian Programmers Set the World Record! June 13, 2017: TechGig has proven that India is at the Top of the Global IT Industry, having won the Guinness World Record for the country by beating the likes of the USA and China to create the biggest programming event of the world! “TechGig Code Gladiators 2017” was organized by TechGig to identify the top competitive programmers and technology enthusiasts across India and the rest of the world. The contest registered 2,09,111 participants with the maximum participation from Bengaluru, India. 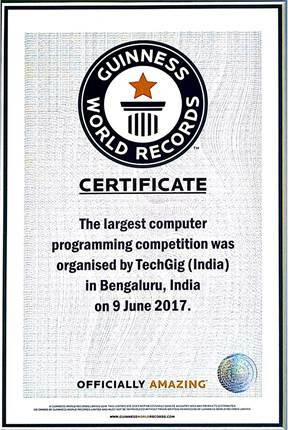 The Guinness World Records citation declares “The largest computer programming competition was organized by TechGig (India) in Bengaluru, India on 9 June 2017”. While presenting the World Record to TechGig, the Guinness officials stated that TechGig had attracted 81,641 unique submissions from programmers at Code Gladiators 2017 and the previous record was set in 2012 by Baidu Online Network Technology (Beijing) Co., Ltd. (China) which had attracted 30,634 entrants. That is 167% of what Baidu holds! “It is amazing that TechGig was able to obliterate the previous record by a margin of over 160% – a record set by Baidu which had stood undisputed for half a decade. 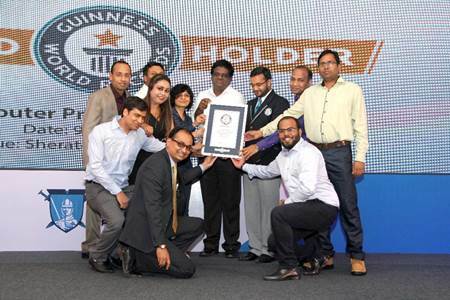 This record is dedicated to all our participants, clients and teams. I further acknowledge the support and enthusiasm of the top management of our sponsors and clients, whose words of encouragement were instrumental in garnering this record-breaking participation. We have received very good feedback on the success of this event and plan to roll-out more such initiatives on an expanded canvas across industries and geographies,” said Ramathreya Krishnamurthi, Business Head, TechGig. This world record competition, included contestants from across the planet, while most the participants were from India, top three other countries were United States of America, United Arab Emirates and United Kingdom. Round 1 of the open contest was held from 20th March to 07th May 2017 during which registered participants were asked to submit their entries remotely from their homes on the dedicated Code Gladiators section of TechGig.com. Basis their performance in Round 1, Semi-Finals were held online from 10th May to 24th May, 2017 for participants who had successfully cleared the first round of the Open Contest. At this level, participants had to solve the Semi Final challenges within 8 hours. The final competition was held offline in Bengaluru, India and TechGig Code Gladiators 2017 concluded on June 9, 2017 with a Grand Finale, where Guinness Officials declared this victory for Indian IT.